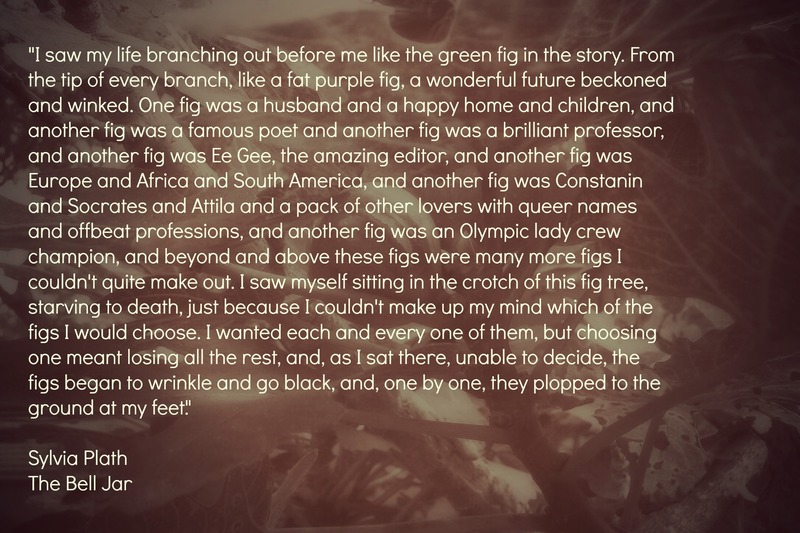 When I first read The Bell Jar in college I had only recently overcome my fear of writing inside books. This was a side-effect of the Montessori education that taught me that math is hard and that books are to be cherished. And so, I scratched little brackets around this passage in pencil and read it over and over again. I was preparing to graduate and while I couldn’t grasp the reality of what that meant, I was feeling the tiny seedlings of trees of possibility and I was thrilled by it. I was thrilled by the confidence I had in knowing that the biggest choice I had to make was already done. In a few weeks I’d be living in New York City and working in advertising. At a time when people who I believed were smarter than me weren’t getting jobs, I had no doubt that I would be fine. The complete certainty I had regarding this decision was the most confident I’d ever been. That was before I knew that the figgy possibilities my gigantic heart would invent were endless. They were far too numerous for me to have seen at the time. My focus was on moving to New York City and it all unfolded so beautifully and perfectly. But how could I have known that in a few years I would fall asleep in my tiny upper west side studio one night and wake up wondering how a Vietnamese morning might smell? How could I have known that the lives we choose for ourselves when we’re tiny, passionate and naive won’t be right for the people we become? We are fuzzy, stupid caterpillars choosing if we want to be striped or brown or green or orange without realizing that someday it might not matter. We have no idea that soon we’ll wrap ourselves up in a complicated muck and come out even more incredible than we can imagine. Life expands and contracts and we learn so much and with all of that intense, screaming, happy, hard learning comes even more possibilities. Larger trees with more figs. And I’m now finding that I want to do everything. I want to do so many things that I can’t imagine being expected to choose just one one. Or just five. Or to choose at all. The lives spread ahead of me are so varied and complex and full of deep, dark reds and thrilling neons. And what goes through my mind when I’m staring into space is not the choice between an advertising career or one in public relations. Or moving to London or New York City. What’s flying through my mind are the orbiting planets of possibility in a thousand different universes. They are disparate and exciting. They are the lives of a hundred different people who have never met. They are the lives of people who have nothing in common. Turns out, I want everything all at once. I want the love and support and hugs of all my friends over and over again. But I also want to feel the freedom of wading through rivers where nobody can find me. I want to wear heels with smart skirts while sitting in meetings where I sound smart and focused. I want never to set foot in another corporate environment again. I want to rid myself of all my things and move into a wood-paneled van and in the next brain-breath I want to keep a huge library of every book that’s ever meant something to me. I want to explore Serbia, Belgium, Belize and Bhutan and I want to have a little house with cozy nooks and paintings that is mine for 40 years. I want to be transient and settled. I want unexpected adventure and staid routine. I want to wear beautiful, glittery necklaces and ones made by dirty, calloused hands out of string and rock. There are so many lives to live and I want to passionately live them all at the same time. I wake up thinking: Today I’ll learn to tap dance and play the trumpet. To watercolor and make websites. Tomorrow I’ll create a calendar empire. I’ll be taught how to frame a house and then build one, and then learn to photograph it in every type of light. I’ll speak Spanish and Hindi and Khmer. Then work at the UN as a translator. I’ll make everybody spring rolls and then teach them all about economics. I’ll learn about economics! I will have the answer to every question that exists about that weird swirling mass of garbage in the Pacific and then design a pack of greeting cards to wrap in twine and give to a stranger on Earth Day. Maybe I’ll build a tree-house and go there to write books and funny little jokes. But before that I might install better shocks on my car and take it to Oaxaca to stuff myself full of tamales. I’ll learn to surf with a belly full of fresh fish, braid the hair of everyone on the beach and then run a marathon. There is so much to do and I want to do it all. I’m not choosing figs. I’m eating them all with my little, passionate hands. I read this over and over and over again. It makes me smile when the day is dreary. It makes me want to hug you. It makes me think about wanting new things and also about being so happy with the things I already have. Thank you! We are truely fortunate to live at a point in Space Time were our fig tree developes into such a robust tree AND that our socio-economic situation affords the figs to be so numerous and suculant AND that our cultural, religious and ethical values permitts us to reach out, pluck and devour these exotic fruits. For I have frequent encountered communities where the environment only permitts a meagre sappling to grow OR the economics prevent all but rudimentary and necessary fruit from developing OR the oppression and ignorance inhibits the collection of, let alone the enjoyment of, these desirable figs. Enjoy your fruit as I will mine.